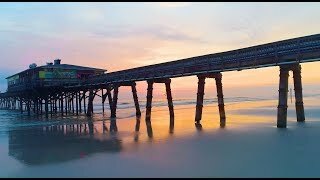 Set against balmy breezes and anchored by 23 miles of clean, hard-packed white sand, for the last 100 years Daytona Beach is known as the World’s Most Famous Beach. It is because of the popularity of auto racing on our hard packed sand. While there is no racing on the beach now, great Daytona tradition of driving on the beach is still alive. Tourists and residents alike treasure our cheery brand of southern hospitality. A little over 500,000 residents in the Daytona Beach metro area and ten million visitors enjoy moderate weather, quality educational choices, exceptional recreational activities, an active arts community and, of course, one of the most beautiful, family-friendly beaches in Florida. The climate in Daytona Beach is also ideal. The area enjoys mild, year-round temperatures. Daytona Beach was made famous for its wide beach and smooth, hard-packed sands. It became widely known in the early 1900s for high-speed auto racing. This made the beach a mecca for racing enthusiasts. Beginning of last century was marked not only by auto racing on the beach, but also by air acrobatics in front of famous Clarendon Hotel, where The Plaza Resort & Spa stand now. You can find photos of Ruth Bancroft Law performing air acrobatics on the beach. Today the hard-packed sand and the alluring Atlantic Ocean attracts ten million tourists annually. The Daytona Beach area boasts one of only a few beaches where driving and parking is allowed. It’s also perfect for building sand castles, walking, bike riding, jogging, fishing, swimming, surfing or just relaxing in the warm sunshine.